3 Museums – One Day – Don’t do it! Only the foolish would try for 3 world class museums in one day – well color me foolish! One of the big reasons I stopped doing group tours was the rush rush wait kind of thing. The tour leader would have a huge long list of things that we must see that day – and his job was to carol the rest of us into going along – regardless of what we’d miss along the way. So I wasn’t too keen to discover that we were going to attempt the same crazy stunt – but without a tour leader! In Munich – there are 4 major museums – all art museums – within about 1 minute walk of each other. Alte Pinakothek, Neue Pinakothek, the Museum of Modern Art and the Brandhorst. We’d picked the 2 Pinakotheks and the Museum of Modern art as our targets of the day – and got a good start, arriving at the front of door of the Alte Pinakothek at about 9:30. Unfortunately – it doesn’t open till 10:00. Sigh. I’m not keen on sitting or standing around in the cold and wet – under any circumstances – so naturally we opted to stroll the neighborhood. Which put us back at the Alte Pinakothek at about 10:15. So much for that early start. Bathroom, ticket purchase, ear phone instructions – and we’re off. The Alte Pinakothek was built by Ludwig I around 1800 for one purpose and one purpose only – to house the most amazing painting by Rubens you’ve every seen. 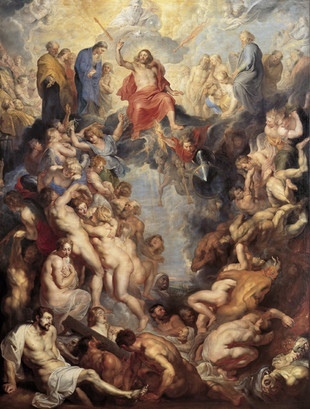 It’s huge – its stunning – and its in a room filled with other examples of his (Peter Paul Rubens) work. I loved that part of the museum the absolute best. There were seats, the explanations were interesting, and the art incredible. There is something so emotional about the works – you can feel the tensions of the damned and glee of the demons without even understanding the story. Also on display are a group of Rembrandt’s. The best to my mind is his rendition of the story of Jacob and Issac on the mountain. Jacob has bent back the neck of his favorite son in preparation for the sacrifice – and is literally saved by the bell. Stunningly beautiful. There were lots of other paintings to gauk at of course – but the work of those 2 artists is reason enough to go to Munich! Next up – a smuggled in lunch and the Neue Pinoteck. This museum was set up by Ludwig II – and takes up where the other leaves off – starting around 1810 or so. 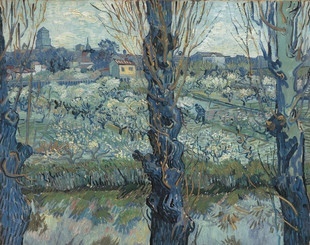 The highlight here are the two Vincent Van Gogh paintings. The sunflower series is known world-wide, it’s iconic – and here is one of them – close enough to touch if the museum guards turn their backs. There is also one of his from the late Arles period – gay to look at quickly, emotionally depressed and isolated you feel as you identify the details – the water separating the viewer from safety and warmth, the lone peasant hunched against a cold wind only he can see. Glorious. Third – there’s the Modern Art Museum. We scored free tickets – not sure how that happened – got our ear phone sets and started to Explore. This gigantic space (are all Modern Art Museums huge?) is sub-divided into 5 sections – A special exhibit with art collected by one gentleman – Theo Wormland – consisting of mostly Max Ernst and Rene Magritte paintings, there’s the collection of the museum, there was another special exhibit of prints by Andy Warhol, there is the ‘Architecture’ Space, and final there is the Museum of Design. Each could stand on its own – as a group they are overwhelming and exhausting. Wouldn’t miss seeing it – but boy was I tried afterwards. My clear favorites – some of the drawings – simple lines, yet so much emotion. I loved the collection called Dream Scapes. While Max Ernst’s work leaves you feeling depressed and unhappy – I have always loved the work of Magritte and Dali. What leaves you stunned is the thought that this one man would have the foresight to invest in this art when all the rest of the world thought these artists were completely crazy. At closing time we drag ourselves out – we have dinner reservations at 7:00 (check out my review of the Atelier – it was dynamite) – but before that we must pay homage to the tomb of Josephine’s son from her first marriage and Napoleon’s Step-son – Eugene de Beauharnais. He’s buried in the Church of St. Michael – and we arrive just as services begin. Organ playing, lights on – beautiful. After the service ends, we check out the tomb. Victor is quite disappointed – they’ve dressed Eugene in a toga. Whatever for – he was in charge of the Chasseurs à Cheval of the Imperial Guard – surely a Chasseur uniform would have been better? But if it’s your tomb – you can do what you want. We walk quietly back towards the restaurant – I’m thinking about my cold wet feet – Vic is still mad that Eugene is wearing a toga for all eternity.